Cousin Gary RV will be glad to answer all your questions and we will help with any of your towing needs. Call us today at (530) 275-6089! Cousin Gary RV has the right towing equipment for your trailer, fifth wheel or RV and can assist you with information about towing capacity, ratings, what’s important, and more! We will help you determine what is the towing capacity of your vehicle which is the first step in getting ‘hooked up’ with the proper towing equipment. We’re familiar with the leading technology in towing products including towing accessories, tow brakes, 5th wheel hitches, composite gliders, weight distribution and sway control, power jacks, cargo management and all other aspects of RV towing. 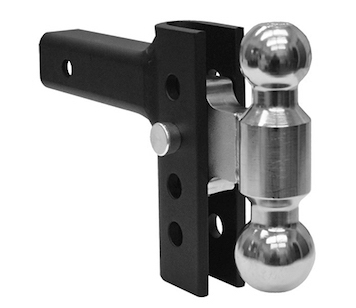 There are a variety of trailer hitches available for your vehicle; some have heads that pivot in multiple directions, some use an under-bed system, some are suspension-type hitches, others are weight-distributing. At Cousin Gary RV, we will help you in choosing the best hitch set-up for your particular vehicle and RV combination. 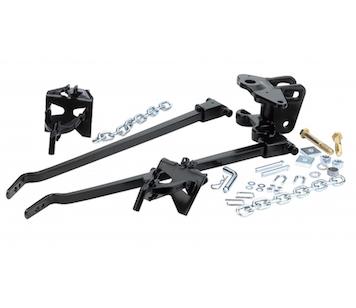 Weight distributing hitches are one of the best choices for towing an RV or trailer. They come in a wide range of weight capacities to give you a smooth ride. 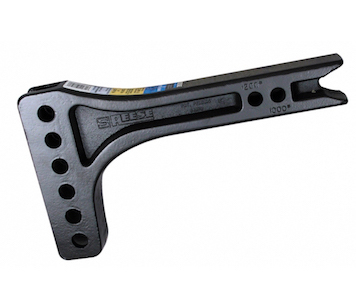 This type of hitch distributes the weight to both of the RV’s rear and front axles. Note: Make sure your trailer as at least 10 or 11 percent of its overall weight on the hitch which will help with safe and stable towing. Using an equalizing (weight-distributing) hitch is also a good choice for a more compact truck. These hitches when adjusted properly can make your towing a safer experience. Tip: Before hitching your trailer to your vehicle, measure the distance from the top of the front and rear wheel wells to the road. Then hook up your RV and take the measurements again. You want your truck to sit pretty level once it’s connected and loaded. This is the total allowable weight of the tow vehicle, the trailer, the cargo in each, hitch hardware, fluids and occupants. This is the total allowable weight for the vehicle, including occupants, fluids, hitch hardware, options, cargo and trailer-hitch weight. This is the total allowable weight on an individual axle. It includes the weight of the tires, wheels, brakes and the axle itself. This is the manufacturer’s weight limit for towed loads. For conventional trailers, this normally includes a hitch-weight limit as well; for fifth-wheels, the pin weight is applied to the trucks GVWR and its rear-axle GAWR. One of the first things you’ll need to do is check with our Towing Specialists at Cousin Gary RV to determine the towing capacity of your vehicle. We’ve been in the RV towing market for over 35 years and have kept up-to-date on the latest information regarding RV and trailer towing. We also advise you to always check your vehicles’ owner’s manual to see what the haul capacity is. If the tow rating is 7,000 pounds and the trailer you want to tow weighs 6700 Pounds full loaded, you may find that the performance is not as good as it’s so close to the tow rating. You might want to consider a smaller RV to allow for additional load, fluids, altitude, etc. 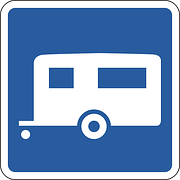 Let us help you find the right RV for your vehicle or the right Tow Hitch to give you a comfortable and safe towing experience. Small trucks can be a fine choice for towing a travel trailer as they are made to haul payloads. What is important is to check the manufacture’s tow rating and make sure you don’t overload the truck beyond what it is capable of towing.